They took up too much room, and I used them infrequently. The only thing of value on them are the barcodes they carry that identify my account with whatever organization they’re tied to. Other folks have talked about doing consolidation in various ways like just scanning images of the cards and printing them all together. There was a site where you typed in card details and they generated barcodes for you, too. I didn’t want to hand my identifiers to a third party, and image scanning wasn’t flexible enough. I wanted to actually have the raw numbers, so I ended up using barcode. I didn’t use the Debian nor Ubuntu package, though, since it lacked SVG support, which was added in the latest (cough March 2013) version. For nostalgic purposes, I dug up my first security update (sponsored by pitti), and my first Ubuntu Security Notice. I’m proud of Ubuntu’s strong security record and how far the security feature list has come. The Ubuntu Security Team is an awesome group of people, and I’m honored to have worked with them. I’m looking forward to the new adventures, but I will miss the previous ones. 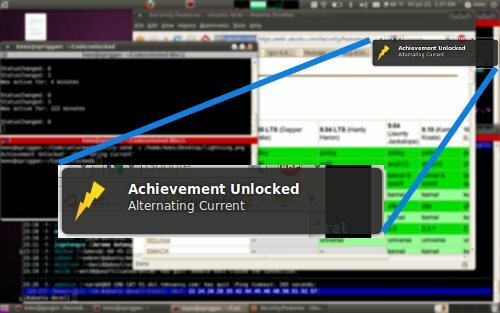 I think it would be fun to add an achievement system to the Ubuntu Desktop, like is done on Steam and XBox. There are all kind of things to track and correlate. Miles moved with the mouse, clicks taken, keys pressed, files opened, applications installed, buddies added, IMs received, sent, etc. There are all kinds of achievements that could be designed that could be used to help people discover how to use Ubuntu, or for just plain humor. “Achievement Unlocked: Application Deficit Disorder” when you uninstall 100 applications you installed in the prior week. I’ve been told this might all be very easy to implement with the Gnome Activity Journal (Zeitgeist), but I haven’t had a chance to investigate further. UPDATE: I can easily imagine this being tracked in CouchDB, synced between systems via UbuntuOne, and could be linked to any other remote APIs that people could dream up, including Launchpad, Forums, REVU, Identi.ca, etc. “The term linear just means that each output bit of the mixing function is the XOR of several of the input bits.” – Practical Cryptography, Niels Ferguson, Bruce Schneier. I edit a lot of other people’s code. Dealing with indenting depth has always plagued me, and I’ve tried all sorts of things to try to address it, but the “real” problems I have are when tabs are mixed into code. I personally use “4 spaces” for code indentation, and if I’m working on code that uses 8, I just hit “tab” twice, and if I’m working on code that uses 2, I can just backspace over the 2-too-many spaces. When the code has actual tabs, things break. When the code has a mix of tabs and spaces, it becomes a serious head-ache. I wrote some vim insanity to detect which indentation type was being used “the most” in a given source file. If anyone has a simpler way to solve this (without switching to a different editor), I’m all ears. What follows are some bits from my .vimrc. Two months ago, I jumped on a fantastic opportunity and took a job with Canonical (leaving OSDL none too soon, it seems). I’m disappointed that OSDL laid off so many of my friends. I had been visiting the office on and off so I could continue to participate in the daily lunchtime board games. It’s the end of an era. I had discovered both to be woefully behind “most recent” for a number of distributions. In my mind popped a vision of a chart/table/matrix of software on one axis and distros on the other, showing which had what versions of things. And little boxes where I could rank the “bleeding-edgeness” of a distro. While hunting around, I found something almost like my vision. The distrowatch website is pretty damn cool. It wasn’t really set up to compare bleeding-edgeness between different distros, just different versions of a distro. For example, here’s Ubuntu’s matrix. downloads them to a local filesystem. … The motivation for this script is to poll places where developers post patches to software we’re testing. To help combat my annoyance with Lana, I think I’m going to measure her screen-time. I’m going to count every minute that she’s on-screen and not dead, or when the on-screen plot is a direct result of her idoicy. (i.e. Clark complaining about something Lana did.) The goal will be to reach a “perfect episode” Lana-minute score of ZERO. As a bonus, I figure I should also track Chloevage minutes. I figure Lana and Chloevage timers shouldn’t run if they’re both on screen at the same time — they cancel eachother; I am neither frowning nor smiling. The Chloevage-minutes would be a tie-breaker for episodes with nearly the same Lana-minutes value. Ah, the physics of abstract television analysis. I have my machines configured for software RAID between my primary and secondary drives. I always have. LILO supported this configuration back in RedHat 5.2 days. I’ve been doing RAID1 for a long time now. About a year ago, I changed my preference for boot loaders to GRUB, and just kind of assumed it handled mirroring. Well, much to my surprise, grub totally and completely does not handle mirrored configurations. Even the proclaimed fix didn’t work. So, moving forward, assuming my bootloader works, all kernels from 2.6.13 forward don’t support devfs, and the older initrd tools can’t handle that. Debian invented “yaird”. I had assumed they used the /sys filesystem and did other smart things. As it turns out, it’s fairly brain-dead. I booted without one of my mirrored drives, and yaird totally freaked out. As I discovered while digging through the initrd yaird generated, it just statically builds device nodes, based on what the running system used to look like. DM devices (LVM, crypto, etc) are dynamically assigned. They may not have the same numbers after rebooting. This is mostly worked around by waiting for stuff to show up in /sys, so I’ll only complain about Ubuntu’s practice of encoding the major/minor numbers for the root device. (e.g. 0xFF00 — my root partition may not always be detected first) I don’t understand this, since the loader handles string-based paths for the root partition. But that’s not the bug I ran into for this rant. I proceeded to find the current source for mdadm, so I could write a patch to fix it. Only then did I discover that Debian’s version of mdadm is 5 REVISIONS BEHIND (including a major version jump)! AAAGGGh! At this point I got in line reporting how old mdadm is, installed a work-around-mdadm patch to my yaird templates, and switched back to LILO. Ugh. And before someone yells “Run Gentoo!”, I checked already. The Gentoo mdadm version is old too. But at least they have a masked ebuild of the modern versions. I’m fairly happy with my amd64 box, but it has some bothers. It reminds me of switching from 16bit to 32bit applications back in the day. Since the SATA drivers were busted on every distro I tried to install, I ended up with Debian Unstable — probably because I know how to dance around needing a more recent kernel. Installing 32bit libs is nice, but Debian isn’t smart enough to let me install .i386.deb files along with my .amd64.deb files. There’s got to be a way, but I haven’t figured it out. So, I followed the Ubuntu instructions, and built a 32bit chroot environment. Any time I want to watch something in Flash, I run “bash32” and run Mozilla in there, which has the Flash plugin. Same for OOo, etc. With the mount bindings (e.g. “mount -o bind /home /chroot/sid/home”) it’s like I never left home. Audio even works. Pretty slick solution. I’m involved in the Open Source as Prior Art initiative. The goal being to more readily make FOSS available as prior art for the US Patent and Trade Office to use while examining software patent applications, reducing the number of poorly issued software patents. This is a rather touchy area given the fact that most FOSS proponents (myself included) would rather see software patents go away completely. However, in the US, this is not likely to happen any time soon, since it’s not up to the USPTO, it’s up to the US Legislature; the USPTO has to implement the law, which puts them in a bind since they’re not very successful right now at finding prior art (and the laws surrounding prior art discovery aren’t that helpful either). In my opinion, if the USPTO could reliably find prior art, they would start rejecting almost all software patent applications, and the futility of software patenting would become clear to those that didn’t already recognize it. If I’m wrong, then I’d hope that with the very few patents issued, innovation really would return to the system. Groklaw has already discussed the OSaPA project and the overall “Patent Quality Improvement” initiatives announced by the USPTO. I’ve read these and several other articles, each ranging from praise to scepticism, looking for more thoughts on subject, trying to help me shape my opinions. One of the most sceptical was written by Greg Aharonian from the Internet Patent News Service (which ironically has no online archives for me to link to). His scepticism is mostly aimed at the USPTO and IBM, and not directly at the various initiatives, past or present. His fundamental point is that the USPTO doesn’t appear to have manged to use the (voluminous) resources it already has at its fingertips, so why would adding more help the situation? This approach didn’t work in the past, and there’s no indication that anything has changed in the USPTO to make it a success this time around. One thing I think he may have missed, though, was that the OSaPA initiative contains another player. The initiative itself may again be the football, and the USPTO and IBM may again be playing, just as with prior (seemingly failed) initiatives. However, this time, the FOSS community is involved. I like to think that in Greg’s analogy, the FOSS community is Charles Schultz. We can draw any damn comic we want, and we’ll still be around after the initiatives, IBM, and the USPTO are long forgotten. The FOSS community is on the multi-hundred year plan, the same as any other sustainable cultural plan. If Greg’s predictions come to pass, and it really does turn out to be a waste of time, I still have faith that it’ll only be the USPTO (and, unfortunately, the US) getting hurt. To borrow from John Gilmore, FOSS will treat this as a defect, and route around it. Regardless of history, I sincerely hope the USPTO takes this novel chance to harness the power of the FOSS community. We’re interested in helping them solve their problems, and if the USPTO drops the ball, it’s unlikely the FOSS community will ever look back. Tonight I discovered that finding out the historical worth of money is a little tricky to calculate. :) On Poirot tonight, he bought 19 pairs of silk stockings in order to trap a thief. The clerk kept warning him that they were “very expensive”. The final bill was 35 shillings per pair. I thought this was rather odd that a value not involving pounds would be considered “very expensive”. Feeling very detective-oriented, I had to investigate. First of all, I found a nice conversion chart for British currency. 35 shillings is 1.75 pounds. The story took place in roughly 1928, but that doesn’t change the shillings calculation because even after the decimalization in 1971, shillings and pounds kept their 20-to-1 ratio. Trying to find “current worth” of historical monies was a little more difficult. I found the How Much Is That? site, and it seems that 1.75 pounds is worth about $95 in present day. Good stockings are about $15 a pair now, and since nylon was invented in 1935, it doesn’t seem unreasonable that good stockings would be about 10 times more expensive in 1928. This afternoon, for no reason at all, I was annoyed that my music didn’t pause when I locked my screen. So I fixed that. Tonight, I checked my RSS feeds and discovered that Corey did exactly the same thing today. What I want now is a way to get xmms to unpause after I unlock my screen. :) I thought of a horrible hack for xscreensaver to do this, but I’m hoping there’s some other way. I saw a mention of the Portland Time-Based Art festival. Looks to be a pretty wild mix of all kinds of performance art. I’ve got to check it out, but it looks a bit pricey (minimum: $125). Portland’s 94.7FM “alternative” radio station is great. (They even have live streaming.) I’ve been especially impressed with the 6PM “Cocktail Mix” by Gustav. His personal collection of electronica is very nice. I’ve never heard Messiah played anywhere other than my stereo or very rarely at clubs. A few weeks ago, he played it. So cool. They’re also running a NIN remix contest I’m pondering entering. I’m not really sure what sort of open software I should use to cook it, though. I found the 1 Second Film project today while trying to remember the name of the movie I saw this weekend. All I could remember was the dude was from Hackers. His name turns out to be Jesse Bradford. (The movie was Happy Endings, which I thought was pretty fun.) I was surprised to see Jesse Bradford listed as a Producer on another film, so I followed the link only to discover that everyone is a producer for the 1 Second Film. Anyone can become a Producer (and get listed on IMDB) by sending them money. The film itself is going to be 1 second of 12 doubled frames of animation (which will be auctioned off after the movie opens). The credits will then roll for 60 minutes, playing next to a “The Making Of” movie. The profits are going to charity, and celebrities seem to have started a bidding war. Their credit-purchasing page is linked to PayPal, so it looks super-easy to support them. Crazy. Day 1 of OSCON was spent recovering from DefCon. I didn’t go to either of my scheduled tutorials. I really wish I could have gotten to see Conway present his Presentation Aikido, since the notes for it are terrific. I also really wish I could have spent some more time with Snort, especially given all the attention I gave to Snort Inline over the last few weeks. Day 2 of OSCON was spent in the RT and Aterisk tutorials. The RT one was very interesting, but more geared towards people wanting to do something MORE than ticket tracking. I was glad to see that 3+ has a much better commandline query tool. That’ll speed up autokees’s “-rt” responses. (“autokees” is my IRC bot that reports OSDL’s open — and closed — RT tickets for the Core Services group.) The Asterisk presentation was fantastic. Capouch really knows his stuff, and his Asterisk demo was very impressive. For the last part of his demo his showed off his home X10 turning on a light in his living room that triggered a motion detector running against his webcam, watching his prized Robert Crumb original, which dropped an Asterisk call file into the server and called him. Time between “X10 on” and his phone ringing: 2 seconds, if that. That tutorial was well organized, and detailed. I think I could probably set up an Asterisk server right now if I didn’t need to go to bed so badly. Well, our team of 3 didn’t do so well at CTF this year (4th in teams). But, I guess, holding our own against teams with 20+ people on them is kind of good. The game’s network was organized very differently from years past, and we had no way for inline Snort to work. They held the machines locally (in a FreeBSD jail), and we just got a network drop so we could share the network with our server. That was pretty disappointing, but I think it made the game much more pure. This year’s focus was on code auditing and binary analysis. Modify the token scoring tool to play victory WAVs any time we scored a point. That worked very well and was a great motivator. I guess I’m going to have to really get cracking with some gdb programming work. Jesse’s auto-stack-overflow-detector rocks, and I think that can be seriously expanded, if not hooked up to Metasploit directly. Comments Off on Plan B sucked! Literally an hour after I finished figuring out how to build a Google Maps site (and having Ken help me with CSS hell), Google goes and changes the API and releases documentation. Aagh. Google retains the right to put advertising on the map in the future. We won two tickets to tonight’s screening of Serenity. I’m so excited! I am such a SciFi junkie. So much, in fact, I have to share the SciFi Ship Size Comparison website. Well, it seems that my stupid questions and bad starts have actually been useful. In learning all the right ways to write patches for the Wine project, I got corrected a lot by the various developers. This is a much better situation to be in than the dreadful dead-air you can sometimes find on other development mailing lists where the more experienced project members just ignore questions and don’t bother to critique patch submissions. That case is so much more frustrating. On the Wine devel list, there was never a shortage of people trying to show me how to make my patches better. It took me several weeks to get a large chunk of code into the project, but in the end, it was well documented, had a test suite, used the correct debug channels, handled memory management correctly, and generally did everything the right way. On top of that success was the fact that the Wine Wiki FAQ, which is studiously kept up to date, ended up recording a lot of my questions (or more importantly, their answers). You’ll find a lot of “K. Cook” in the Coding Hints section now. While there may be no such thing as a stupid question, they’re clearly newbie questions if everything you ask ends up in the FAQ. :) Hopefully my bumbling will be useful to other folks in the future.